This month we wanted a chair that is perfect for summer and we found just that with the “Kanom” Chair from Thinkk Studio for the Mobella Company. This chair is perfect for a relaxing afternoon in your backyard. Turn on some music, catch some sun, and sip a fruity cocktail. Inspired by the banana leaves that are found wrapping many Thai food delicacies this chair just screams tropical getaway. 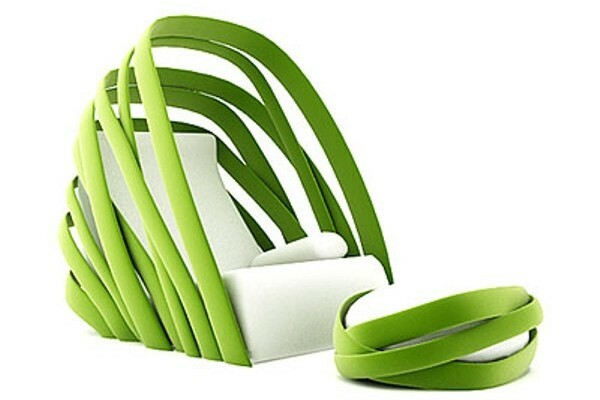 The chair is constructed of a bush sponge iron frame with upholstered fabric and offered in a green color that pulls directly from the banana leaf inspiration in which the chair was created from. It is suitable for outdoor use so you can relax the summer away outdoors. So grab a book or a magazine or choose to do nothing at all but relax. Pull up a seat in your own Kanom chair and enjoy the rest of what summer has to offer.